At TC Transcontinental, we’re dedicated to providing you with reliable, high-quality coating products that stand up to the most challenging applications. Our line of reflex™ branded hardcoated polyester films are developed and manufactured in our clean room facilities in the USA and UK. They provide a reliable solution for Durable Label, HMI (Human Machine Interface), and MTS (membrane touch switch) applications, among others. Learn more about our reflex™ branded products. 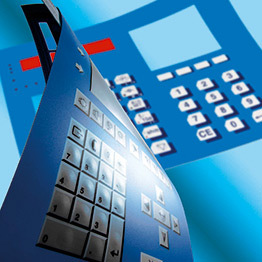 The reflex™ line includes a range of high-performance graphic overlay and protection films developed to meet the exacting requirements of HMI, Membrane Touch Switch, Fascia, Durable Label, and electronic display manufacturers for their customers’ end users. We have designed optimal performance characteristics in hardness, embossability, chemical resistance, and extensive switch life while maintaining the ability to die cut technically challenging parts. Learn more about our reflex™ hardcoated polyester films. The reflex™ CE Gloss hardcoated film is a clear gloss embossable hardcoated film that exhibits the required cosmetic characteristics for many high-end electronic display and HMI applications that have large display windows designed into the part. They are coated in ISO 7 Class clean rooms, exhibit outstanding chemical, scratch, and scuffing resistance, and have a flex life exceeding 5 million actuations. Similar to our LT Textured Hardcoated Polyester Film, LT Digital Hardcoated Polyester Film is a high-performance overlay film designed for HMI and other printed graphic applications where tight registration tolerance is demanded. It is embossable, displays outstanding color acuity when printed, is chemical resistant, and provides an excellent print receptive surface for UV InkJet printing technology. The print receptive primer is also highly compatible with solvent and UV screen print ink systems. Our reflex™ LT hardcoated films provide antimicrobial functionality to eliminate the growth of harmful bacteria, mold, and fungi. This is achieved by incorporating a silver based, antimicrobial additive from SteriTouch®. All active components used by SteriTouch® hold EPA and FDA approval for food contact, as well as being supported for inclusion on the Biocidal Products Regulation, enabling their use throughout Europe and North America. The reflex™ antimicrobial film is especially ideal for touch panels used in hygienic settings such as healthcare and catering, where it is imperative to keep bacteria and mold to a minimum. If you’re interested in working with TC Transcontinental in the development or manufacturing of your company’s flexible hardcoated polyester films, then fill out an online inquiry to get started. Our colleagues will be happy to work with you to find the best solution for your business.